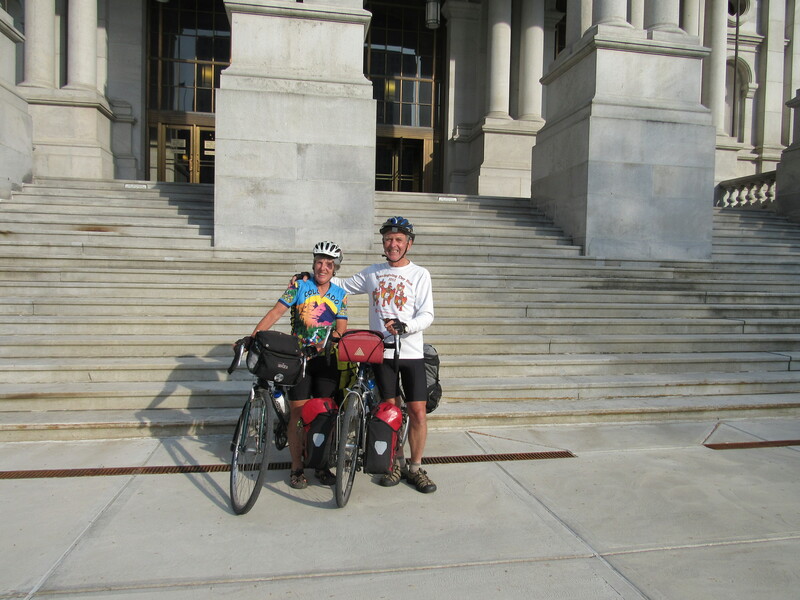 Bill and Ann Testerman biked from Washington, DC to Albany, completing three of America’s longest trails, including the Erie Canalway Trail. Like many visitors from outside of New York State, Bill and Ann were impressed by the friendliness of the people and pleasantly surprised by the farmland surrounding much of the trail. Bill and Ann Testerman of Anacortes, Washington enjoy long distance trails. They’ve through-hiked both the Appalachian Trail and El Camino de Santiago and biked across the United States. This past spring they biked from Washington, DC to Pittsburgh using the Chesapeake & Ohio Canal and Great Allegheny Passage Trails and from Buffalo to Albany using the Erie Canalway Trail, becoming End-to-Enders in the process. Upon arriving in Albany, Bill and Ann stopped by the Parks & Trails New York offices to share their End-to-End experience. The Testermans began their journey in Buffalo and arrived in Albany eight days later. To find their way across the Erie Canalway Trail they used the Cycling the Erie Canal guidebook and averaged about 40-50 miles per day. The friendliness of everyone they encountered along the way impressed Bill the most. Erie Canal lock workers and business owners gave them tips on the easiest ways to navigate some of the on-road sections. “In Little Falls, we were invited to an art gallery with a live Jazz performance and lots of free hors d’oeuvres. By the end of the evening we felt like we knew the whole town,” said Bill. Like many people from outside of New York State, Bill and Ann were pleasantly surprised by the rolling farmland surrounding much of the trail in Western New York. They said they had no idea there was so much agriculture since the image of New York City always came to mind when they thought of New York State. The Testermans’ experience along the Erie Canalway Trail was enjoyable enough for them to say that they would definitely recommend the journey to their friends back home in Washington State. In 2012, Parks & Trails New York and the NYS Canal Corporation launched the End-to-End program as a way to recognize those who complete the entire 360-mile Erie Canalway Trail. Since then, almost 2,000 people have registered as End-to-Enders and shared their experiences. To submit your own End-to-End story or learn more about the program visit the PTNY website.